Live Music: Friday and Saturday nights at 6pm in the Foggy Goggle Lounge. Check out our winter music concert series on Friday and Saturday nights in the Foggy Goggle! Enjoy some excellent night skiing on the mountain and drop in to the lounge to warm up, grab a tasty drink, and enjoy a wide variety of live performances. Friday night sets are mostly acoustic and are all ages. On Saturday things can get a little more rowdy and are for ages 21+. All shows are free of charge! A retro soul band hailing from Seattle, specializing in playing tributes from some of soul, Motown and R&B's greats such as Stevie Wonder, Marvin Gaye, Al Green and more. Sure to get you dancing! Wenatchee local Gavin McLaughlin has been playing guitar and signing for nearly 16 years and will bring his acoustic performance influenced by classic rock, country, blues, jazz and more to the Foggy Goggle. 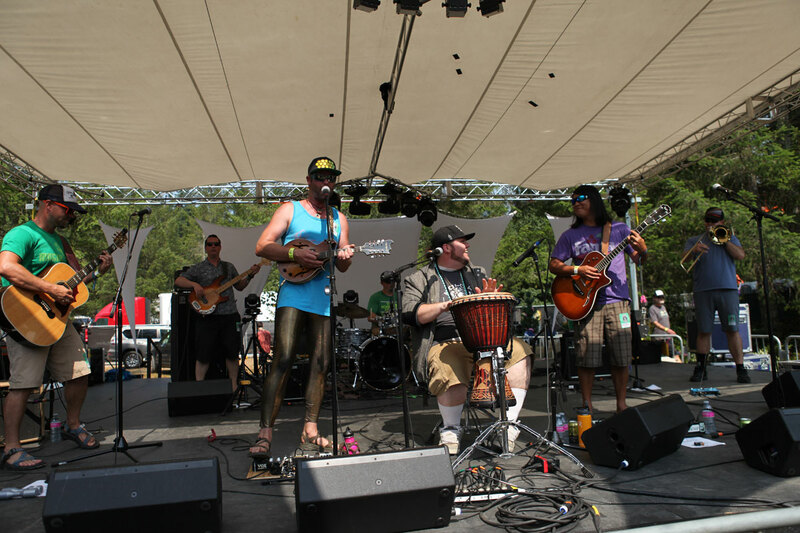 Far Out West brings a unique and energetic brand of funk that features groovy beats and rootsy vocals. The quartet performs a spectrum of sounds; their original songs fuse together soulful folk-inspired lyrics with crunchy instrumental endeavors guided by the stylings of jazz and rock. Join us for an evening of folk music that blends a multitude of influences with local musicians Sean "Rib" Horst and Erin McNamee. Pasco, Washington's Los Caipirinhos is sure to entertain with their unique version of Reggae & Ska. Garrido has been performing with bands in the area for over a decade and has recently been performing as a solo artist. He embraces the roots of country music, from Jim Reeves to Merle Haggard. Spend your Saturday night with Stevens Pass favorites Spare Rib & the Bluegrass Sauce. Playing a mixture of classic rock, traditional and old timey tunes that merge bluegrass with jams, get ready to spend your evening hootin', hollerin' and stompin' along. Leavenworth duo River Dog Shakedown play acoustic Americana with guitar, banjo and vocal harmonies. Based out of Seattle, All Star Opera at surface level is a Hip-Hop/Soul band made up of two emcees and a four-piece band. Listen a little closer and one will find a collective of artists balancing a diversity of talents and influences. Magdeline is a singer/songwriter and Leavenworth native with soul and blues influences. Her raspy voice and original style is sure to captivate you. Marshall Law is a Seattle-based Funk-Hop band led by MC, Marshall Hugh and backed by a five piece instrument toting groove machine. Highway 2 local and accomplished singer-songwriter Erin McNamee returns to the Foggy Goggle for a performance to play folk music that blends a multitude of influences together, from Celtic, blues, jazz, folk and more. Take It To Space, hailing from Tacoma, return to the Foggy Goggle with their unique fusion of jazz, funk, rock, reggae and blues sure to fill the dance floor. Buzz Brump returns to Stevens Pass. Get ready to spend your evening gettin' down on the dance floor to their funky grooves. Come jam out with Seattle's own Guitar & Bass duo! They will be playing from a repertoire of their favorites: Grateful Dead, Tom Petty, Neil Young, to name a few. Crushwater crafts original songs with vocals that interlace harmony and interwoven male/female interplay, enraptured by a bed of lush violins, full harmonies, resonant guitars, and driving rhythms. Playing high-energy rock n roll that channels the soul of Motown, Seattle's The Staxx Brothers will keep your hips shaking all night.